One of my favorite things about this season is all of the limited edition items that brands come out with. 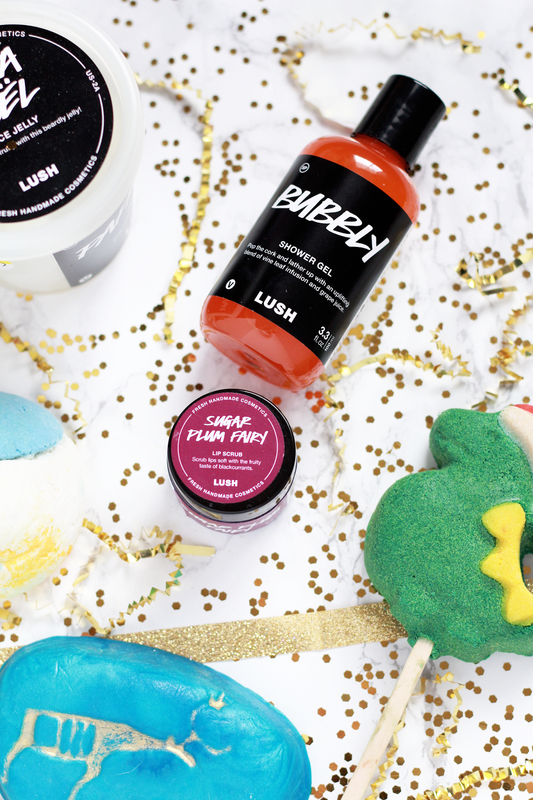 Lush is one that consistently comes out with a range of products in their seasonal holiday collection. I always love how creative everything looks, especially the bath bombs. This year there are some wonderful new additions as well as re-introduced favorites (with a new look!). Unfortunately some of the items contained in this post are already sold out online, but you might be able to get them in a store nearest to you. This year not only features new and old favorites, but also a lot of gift sets. 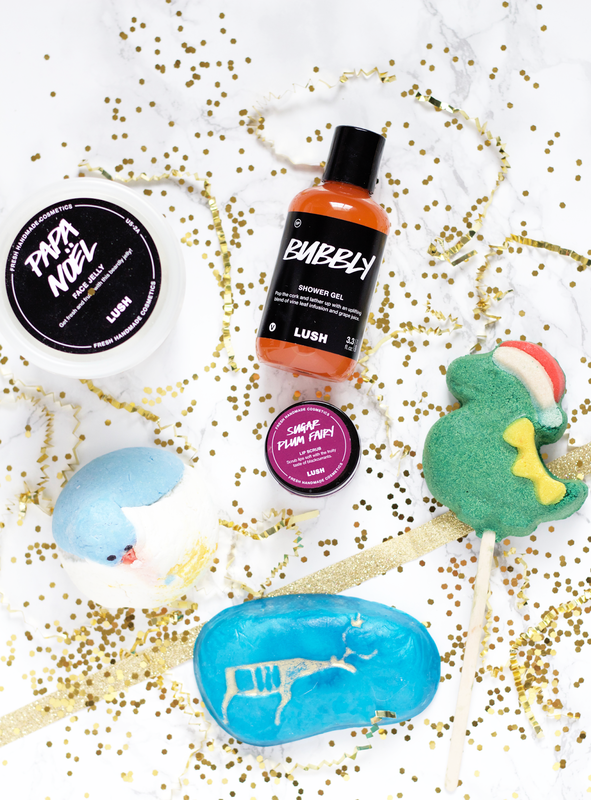 If you're crunched on time, they would be a great quick gift to get for someone who loves Lush products. Going in person to a store nearest to you would be a good opportunity to see the sets themselves. They would make fabulous New Year's gifts or late holiday gifts. Since they are already pre-wrapped, you don't need to worry about the extra time needed to wrap them. A favorite product of mine from the holiday collection is Bubbly*, it's one of the three Shower Gels featured and is brand new (the other two being Snow Fairy and Rose Jam). It is an orange colored gel that smells like a light blended mix of sweet orange candy and grapefruit, which is actually a really nice smell in the morning to wake up to. The fresh citrus-y scent is reminiscent to Celebrate Hand/Body Lotion and Golden Wonder Bath Bomb, as it does share similar ingredients. This doesn't evoke any festive feelings for me personally, but I do think it's a great addition to the collection. I really enjoy the smell since it's not very overpowering and it's not too sweet. It's very moisturizing and lathers well, I love how soft my skin feels after. I do find that the smell doesn't hold very long afterwards, but that's not a make-or-break deal for me. Another new addition this year is Santasaurus*, a reusable bubble bar scented with Lush's Honey I Washed The Kids perfume. It has that caramel, sweet honey fragrance with brazilian orange oil and bergamot oil being key ingredients. 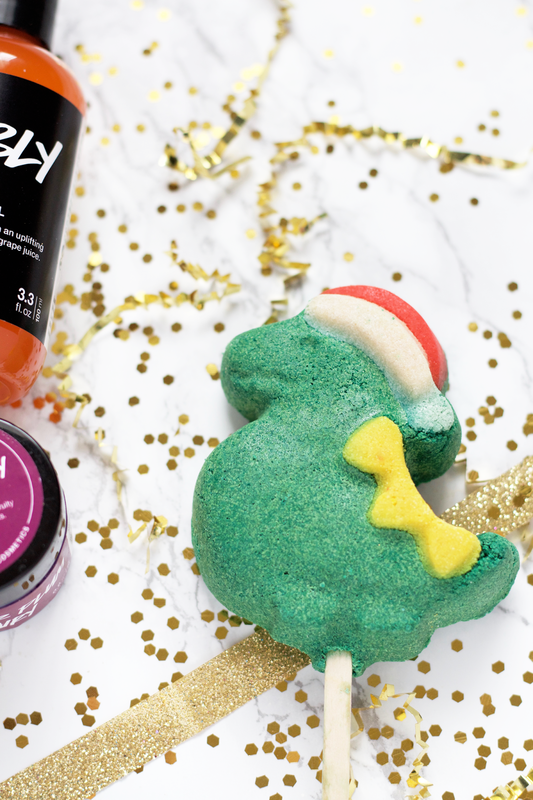 What I love about this specific bubble bar is not only is it super cute (I mean c'mon, it's a dino with a santa hat?) but you get a good couple uses out of it, too! Running it straight under the water creates such big, wonderful bubbles that smell so freaking amazing. The water will turn a light forest green, making it truly a festive product. Due to it being reusable, it is quite tough but you can easily break apart pieces and swirl it in the tub as the water is running (I like to hold it about 3/4 up on the stick). It's really moisturizing, which is exactly what's needed during this month. Ingredients (Bubbly): Vine Leaf Infusion (Vitis Vinifera), Sodium Laureth Sulfate, Glycerine , Sodium Cocoamphoacetate, Lauryl Betaine, Fragrance, *Limonene, Sweet Wild Orange Oil (Citrus Sinensis), Lime Oil (Citrus Aurantifolia), Fresh Grape Juice (Vitis Vinifera), Lactic Acid, Carrageenan Extract (Chondrus Crispus), *Citral, Citronellol, *Linalool, Orange 4. Ingredients (Santasaurus): Sodium Carbonate, Cream of Tartar (Potassium Bitartrate), Sodium Laureth Sulfate, Glycerine, Lauryl Betaine, Fragrance, Brazilian Orange Oil (Citrus sinensis), Bergamot Oil (Citrus Aurantium Bergamia), Amyl Cinnamal, Lilial, Citronellol, *Limonene, *Linalool, Yellow 10, Green 5, Red 4. I cannot get enough of these cute characters that Lush comes out with during the holidays. 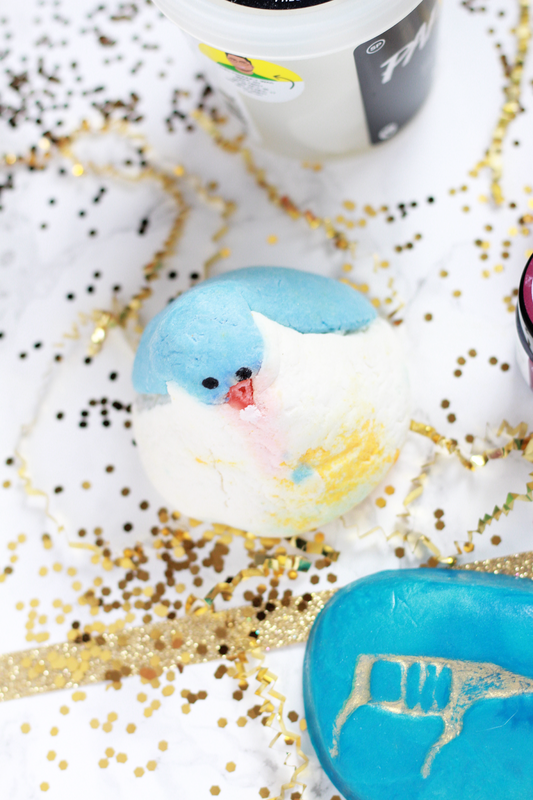 The Christmas Penguin* bubble bar returns this year and I'm so happy to have it. It has a light and fresh citrusy scent that is so relaxing, with bergamot oil, Sicilian lemon and mandarin oil, and orange flower absolute. They use the same scent that's featured in their shower gel, The Olive Branch. I love holding it in my hand under the running water and applying pressure to help it crumble. It turns the bath water a really pretty blue/aqua color. I think not everybody will enjoy how light this scent is, but I really think it's nice to have for the times when you just want a little something to help uplift your spirits. The holiday season is very difficult for a lot of people for many different reasons and anything that can uplift moods, thoughts, or feelings, I think is very beneficial. The bubbles in this also were a lot and my skin felt really soft afterwards. The best way to get a few uses out of this would be to cut it into a few pieces and save them for later, and I especially would advise doing so if you're unable to get your hands on more than one of this product. Ingredients: Sodium Bicarbonate, Cream of Tartar (Potassium bitartrate), Sodium Laureth Sulfate, Lauryl Betaine , Corn Starch (Zea Mays), Fragrance, Bergamot Oil (Citrus Aurantium bergamia), Sicilian Lemon Oil (Citrus limonum), Orange Flower Absolute (Citrus Aurantium amara), Sicilian Mandarin Oil (Citrus Nobilis), Water (Aqua), Citric Acid, Glyceryl Stearate SE, PVP, Hydroxyethylcellulose, Titanium Dioxide, *Limonene, *Linalool, Hydroxycitronellal, Lilial, Blue 1, Green 3, Yellow 5 Lake, Iron Oxides, Cola Pip (Sugar, Glucose, Citric Acid, Flavour, Red 40). 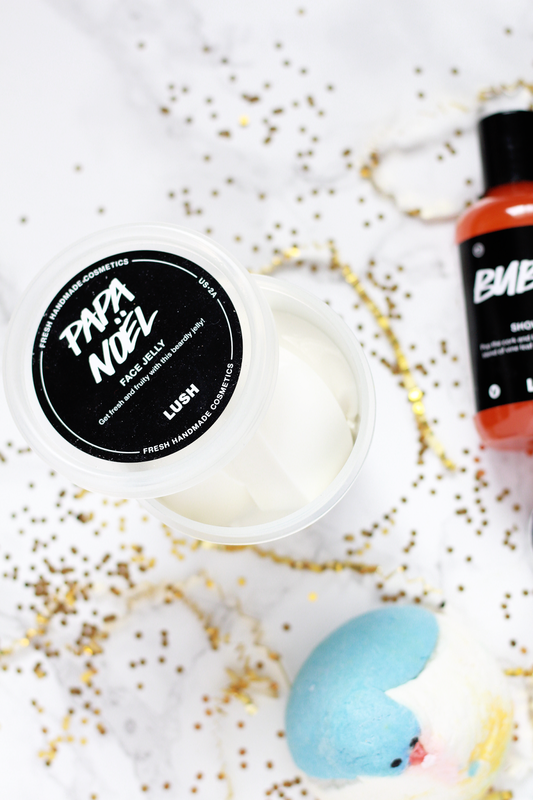 Papa Noel Face Jelly* was a product that I kind of had to warm up to. I didn't really enjoy it at first nor did I really understand what it was. Essentially it's a jelly paste that resembles Santa Claus' beard that's used as a facial cleanser. It includes ingredients like kaolin clay, carrageenan seaweed, organic jojoba oil, and multiple citrus oils. The scent is a bit overwhelming at first, to be honest, smells a lot like tangerine (there is tangerine oil in this). My first try of this product was cutting little pieces off and adding water to get a lather and then applying it onto my face. It has very minimal lather ability and it felt like I was pushing around chunks of jelly mixed in with dissolved portions of the product. After that seemed to not work, I then tried getting bigger pieces and adding water, which worked a bit better. The kaolin and carrageenan seaweed ingredients are not going to give you much lather ability with this product, so do keep that in mind, and you really need to run it well under water and massage the piece in your palm before applying it on your face. You also could just take the whole product itself and wipe it over your whole face, but I have not tried that and I'm not sure how well that would fair out (do tell me if you do this, however!). I do feel like this cleanser did well to clean my face and provide moisturizing properties, but the citrus ingredients might be irritating to some who have sensitive skin. I would keep this in mind if you are looking into trying this (as it not only contains tangerine, orange, lime, and lemon, but also limonene, citral, linalool). Ingredients: Water (Aqua), Glycerine, Kaolin, Sodium Lauroyl Sarcosinate, Carrageenan Extract (Chondrus crispus), Sodium Cocoamphoacetate, Fragrance, Lilial, Organic Jojoba Oil (Simmondsia chinensis), Tangerine Oil (Citrus reticulata), Lime Oil (Citrus aurantifolia), Whole Fresh Organic Orange (Citrus Aurantium Dulcis), Whole Fresh Organic Lemon (Citrus Limon), Titanium Dioxide, *Citral, *Limonene, *Linalool. I've previously used one of Lush's lip scrubs but I never had tried one with a flavor. Sugar Plum Fairy* is a swirl of purple and blue that reminds me of a galaxy, it's a new sugar scrub that will exfoliate and soften dry winter lips. It contains ingredients like organic jojoba oil and sweet wild orange oil, and smells like bubblegum. This is a must-have from the collection, I'm not even joking. Run out to your nearest Lush and grab it before it sells out. It not only smells amazing but makes my lips feel so good after scrubbing it, I also apply the accompanying Sugar Plum Fairy Lip Tint* afterwards and it is like heaven. The Lip Tint contains organic jojoba oil and sweet wild orange oil like the sugar scrub, but it also includes kalahari melon and sunflower wax to add more hydration. Both smell so amazing. Contrary to the stock picture, the Lip Tint actually shows up pink rather than purple on me. Reindeer Rock* is a returning soap to this year's collection but has a brand new look. This is a pebble shaped soap that's specifically been individually made to fit into the shape of your hand. It is made with a 100% palm-free soap base and is dusted with plastic-free mineral-based luster over the golden reindeer design. The color and design of this soap is totally something else. It has a vibrant blue color and depicts an image of a reindeer that is reminiscent of cave paintings (my years of Art History courses flash before my eyes). I'm really glad that Lush not only brought back this product but totally changed the look and shape of it, block soaps are such a pain to use and this has been so user friendly to have in the shower. The scent is so refreshing, it's a mixture of a sweet blend of aromatic jasmine, rose oil, and neroli oil, with fruity lingonberry. There's also a bit of heaviness to it, which really balances it out. It lathers very well and I love that I can still smell the fragrance well after I've used it. I usually like using shower gels since I find that soap bars dry my skin out, but this did the complete opposite. My skin felt so moisturized and soft, I really was super impressed. This really should be available all year round, the scent is very universal and I'd love to be able to get more of it when I run out. Ingredients (Sugar Plum Fairy): Castor Sugar, Organic Jojoba Oil (Simmondsia chinensis), Sweet Wild Orange Oil (Citrus sinensis), *Citral, *Limonene, Flavor, Lustre Dust (Synthetic Fluorphlogopite, Red 28, Blue 1). Ingredients (Reindeer Rock): Lingonberry Infusion (Vaccinium Vitis-Idaea), Glycerine, Rapeseed Oil; Coconut Oil (Brassica napus; Cocos nucifera), Sorbitol, Water (Aqua), Fragrance, Extra Virgin Coconut Oil (Cocos nucifera), Jasmine Absolute (Jasminum grandiflorum), Neroli Oil (Citrus Aurantium amara), Rose Oil (Rosa damascena), Sodium Chloride, Citric Acid, Sodium Bicarbonate, EDTA, Tetrasodium Editronate, Sodium Hydroxide, *Citral, Citronellol, Geraniol, Hydroxycitronellal, *Limonene, *Linalool, Glacier Blue; Radiant Gold (Mica, Titanium Dioxide, Iron Oxide, Blue 1) Blue 1. 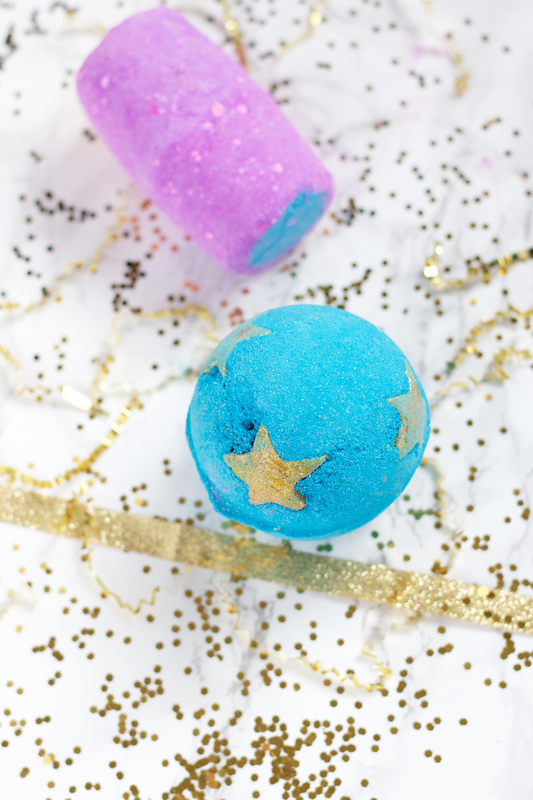 Northern Lights* and Shoot For The Stars* bath bombs have both returned for this year's holiday collection but have debuted new looks! I've always wanted to try Shoot For The Stars so I was super excited to be able to try it. Shoot For The Stars is a beautiful vibrant blue color with three golden stars decorated on the outside. It is such a cute design and I really prefer it over the original. This bath bomb has the most luscious scent I've ever smelled, I want to dunk my head into a pool of it and never come out. It is so wonderfully uplifting and delicious, it has a strong aromatic scent of Brazilian orange and bergamot oil with a very sweet caramel honey fragrance. This doesn't exactly exemplify a festive spirit but I think the scent definitely can be attributed to this season (and really all year round, too). This creates the most beautiful blue artwork once you place it in your tub, as it spirals and unleashes layers of blue hue. As it gets smaller, the stars break away to reveal their true identity: they actually are bath melts! There are six in total and they add such a high moisturizing factor with their buttery and oily base. They also contain glitter particles that will get on you and will need to be cleaned up afterwards, so do keep that in mind. I do not recommend using this bath bomb if you are wanting to wash your hair, otherwise it will be a greaseball (and did I mention glitter?). The colors swirling together are very reminiscent of Van Gogh's The Starry Night, which makes this extra special to me. I love that the scent was still very present on me hours after my bath. This is such a superb product and truly I believe it's a must have. Northern Lights is a bath bomb that similarly has an intoxicating and sensual scent, it's infused with ylang ylang and jasmine to calm, uplift spirits, and provide relaxation. It is quite a strong, aromatic scent that some may not like but I really do enjoy it. The bath bomb is a vivid purple color with yellow and blue sandwiched in the middle on either side. Compared to its design previously, it's much shorter and a lot bigger in width. This bath bomb's art is truly one so creative, it's an explosion of purple, blue, and yellow from all sides that blend so vividly. It's almost like I'm watching the scene of Sleeping Beauty's fairy godmother's using their wands to change her dress different colors! Once the colors begin to mix more, it becomes more of a deep green color, which I thought is kind of interesting. I think some people will be disappointed since they will expect to have purple water and not this kind of murky green, but I didn't really mind since I enjoyed the 'show.' Watching the bath bomb dissolve in the water was also such a calming activity itself, and the northern lights are predominantly this kind of green color so I think Lush did a great job. I did notice that the scent of the bath bomb wasn't as strong as before but I think I prefer that since it provides such a calming atmosphere once you're in the tub. Ingredients (Shoot For The Stars): Sodium Bicarbonate, Citric Acid, Fair Trade Organic Cocoa Butter (Theobroma Cacao), Brazilian Orange Oil (Citrus sinensis), Bergamot Oil (Citrus Aurantium bergamia), Cream of Tartar (Potassium bitartrate), Corn Starch (Zea Mays), Gardenia Extract (Gardenia jasminoides), Coconut Cream (Cocos nucifera), Water (Aqua), Almond Oil (Prunus dulcis), Sodium Laureth Sulfate, PEG-6 Caprylic / Capric Glycerides & PEG60 Almond Glycerides, Lauryl Betaine, Lilial , Citronellol, *Limonene, *Linalool, Fragrance, Gold Glimmer Lustre; Radiant Gold Lustre; Ice Blue Lustre (Synthetic Fluorphlogopite, Iron Oxides, Silica, Mica, Blue 1 Lake, Corn Starch (Zea Mays)), Yellow 5, Yellow 5 Lake, Blue 1. Ingredients (Northern Lights): Sodium Bicarbonate, Citric Acid, Jasmine Absolute (Jasminum grandiflorum), Ylang Ylang Oil (Cananga odorata), Cream of Tartar (Potassium bitartrate), Sodium Laureth Sulfate, Dipropylene Glycol, Lauryl Betaine, Amyl Cinnamal, Lilial, Hydroxycitronellal, *Linalool, *Limonene, Fragrance, Blue 1, Yellow 8, Red 28, Green 8. I definitely recommend picking up some of these items before they are gone! A good amount are still online to purchase and it wouldn't hurt to check your closest Lush location for ones you want that are sold out. 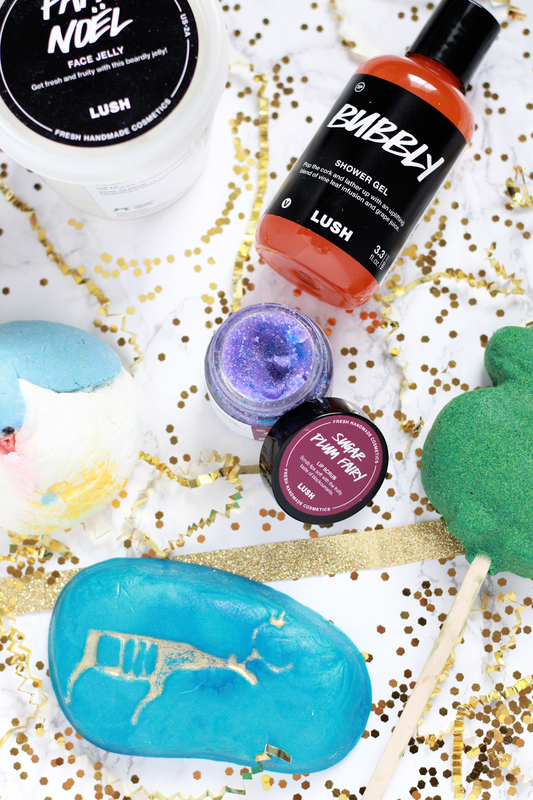 Have you tried any of Lush's holiday collection items? What have been your favorites if you have?